Ulas A. Samchuk (7 (20) February 1905, village Derman, Zdolbuniv district, Rivne Oblast – July 9, 1987, Toronto) – Ukrainian writer. He was born in a family of farmers, learned in elementary school in Derman (1917 – 1920 years), the Ukrainian Gymnasium in Kremenets (1921 – 1925 years). Called to the Polish army, he escaped in 1927 from it to Germany (1927 – 1929), then moved to Prague (1929 – 1941). In Prague, he becomes the ranks of the Organisation of Ukrainian nattionalists, deals with issues of culture. In November 1943, fleeing before the advance of the Soviet "liberators", Samchuk moved to Lviv, and then – to Germany (1944 – 1948). In 1948 as a displaced person (DP), he received permission to move to Canada. In Toronto he lived the rest of his life. Creative way of Samchuk-writer began quite early – his first story was published in 1926. 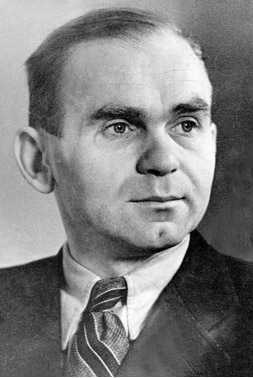 The publication of the novel trilogy "Volyn" (1932 – 1937 years) earned him a well-deserved honor. Great prose – novels – became the main genre of his work. In 1946 – 1948 years Samchuk headed "Artistic Ukrainian Movement" (MUR) – the organization of Ukrainian writers in exile. Work on the second trilogy – "Ost" – stretching from 1945 to 1982. In addition to novels, Samchuk published several books of memoirs, leaving a large, yet unexplored epistolary heritage. In 1980, his candidacy was nominated for the Nobel Prize for Literature, which he, however, did not received. In Soviet Ukraine his name was under a double ban – as an emigrant, refugee from the Soviet paradise, and as a Ukrainian (nationalist). Only in independent Ukraine started to publish his works. In city Rivne builded monument of Ulas Samchuk, in villages Derman and Tylyavka works Memorial Museum of writer.